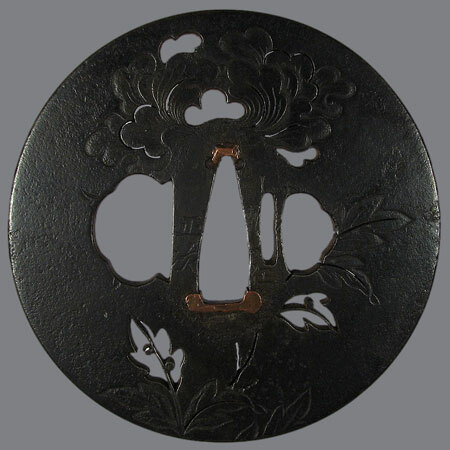 Iron tsuba with a branch of peony (botan). The picture is cut in low relief, some elements are cut trough. Peony is considered to be "the sovereign of the flowers" in Japan. Brought to Japan from China it was valued for its beauty and medicinal properties. 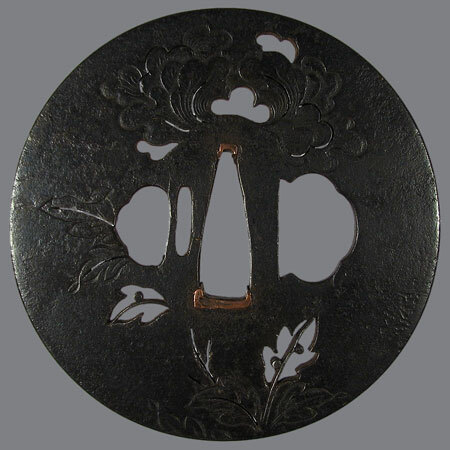 As a family crest it was ranked almost as high as the chrysanthemum, paulownia and aoi in prestige. Author - a member of the Ito school. Lived in Musashi province in the beginning of the 19th century. Worked in pure Bushu style, with iron, mostly carved designs and some with ito cutting. 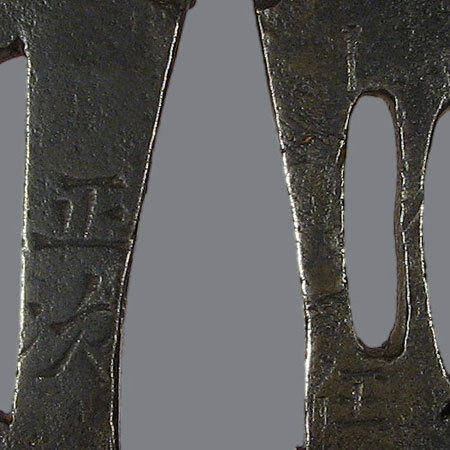 Both Hitsu ana are most likely a later addition, as well as the other opening (over the inscription) with unknown purpose. Inscription: 小田原住 正次 (Odawara-Ju Masatsugu). Ito school. Iron, ito sukashi, shishiai bori, nunome zogan (almost lost)..
Maru gata, kaku mimi; 7,6 х 7,3 cm.